The Archaeological Museum of Olympia, one of the most important museums in Greece, presents the long history of the most celebrated sanctuary of antiquity, the sanctuary of Zeus, father of both gods and men, where the Olympic games were born. The museum's permanent exhibition contains finds from the excavations in the sacred precinct of the Altis dating from prehistoric times to the Early Christian period.Among the many precious exhibits the sculpture collection, for which the museum is most famous, the bronze collection, the richest collection of its type in the world, and the large terracottas collection, are especially noteworthy. The museum building comprises exhibition rooms, auxiliary spaces and storerooms. The vestibule and twelve exhibition rooms contain objects excavated in the Altis. The auxiliary spaces (lavatories) are located in the museum's east wing; a separate building between the museum and the archaeological site houses a book and souvenir shop. Finally, part of the east wing and the basement are dedicated to storage and conservation of terracottas, bronze, stone, mosaics and minor objects. The sculptured ornaments from the Temple of Zeus. ﻿There were 42 figures decorating the 2 pediments of the temple, 12 metopes and the lion-headed water spouts running along the lengths of the temple. It is one of the best surviving ensembles from ancient Greek works of art. They belong to the "austere style" and date to the 1st half of the 5th century B.C. The eastern pediment depicts the chariot race between Pelops and Oinomaos, and the central figure which dominates the work is of Zeus. The western pediment depicts the abduction of the Lapith women by Centaurs, and has Apollo as its central figure. The metopes bear the relief representation of Hercules' labours. These sculptures were made during the 5th century B.C. One of the masterpieces of ancient Greek art. Hermes, as Pausanias informs us, is depicted carrying the infant Dionysos. Made from Parian marble it stands 2,10m in height. It is thought to be an original of the great sculptor and it is dated to ca. 330 B.C. The statue depicts a winged woman. An inscription on the base states that the statue was dedicated by the Messenians and the Naupactians for their victory against the Lacedaemonians (Spartans), in the Archidamian (Peloponnesian) war prabably in 421 B.C. It is the work of the sculptor Paionios of Mende in Chalkidiki, who also made the acroteria of the Temple of Zeus. Nike, cut from Parian marble, has a height of 2,115m, but with the tips of her (now broken) wings would have reached 3m. In its completed form, the monument with its triangular base (8,81m high) would have stood at the height of 10,92m. giving the impression of Nike triumphantly descending from Olympos. It dates from 421 B.C. 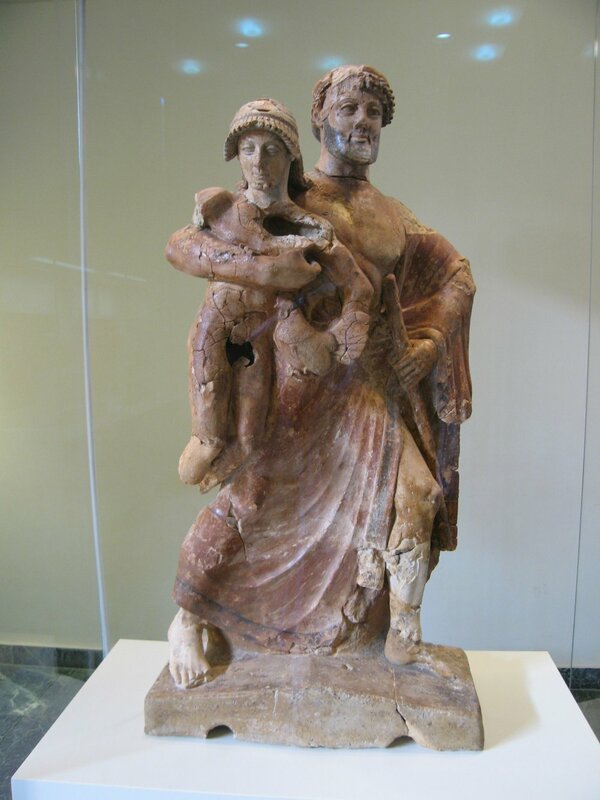 A terracotta statuette depicting Zeus carrying off young Ganymedes. Probably an acroterion of a temple, dated to 480-470 B.C. Dedication by Miltiades, as the inscription informs us "Miltiades dedicates to Zeus". 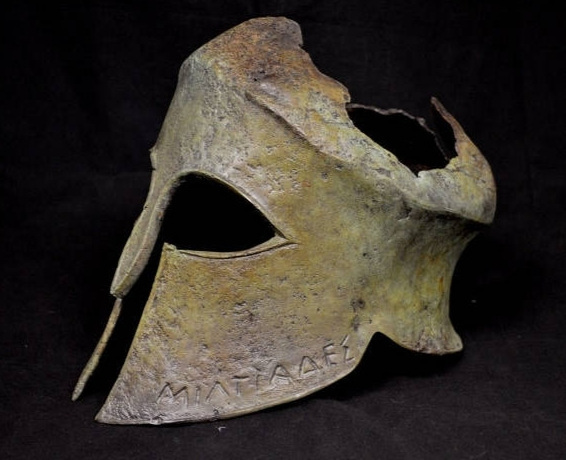 It is the same helmet worn by the Athenian general in the battle of Marathon, where he defeated the Persians, and thus offered it to Zeus as a sign of gratitude. The only surviving besieging instrument of its kind from Antiquity. On all sides of the battering-ram there are symbolic depictions of rams heads, from where indeed it got its name. 5th century B.C. It is dated in the transition between the Geometric to the Archaic period. It is unique for its monumentality on comparison with the small scale of other artefacts from the Geometric period.